I couldn't resist, I had to try this streusel coffee cake. I made some adjustments, as usual, so I'm posting the recipe here with my revisions. I increased the streusel, because the best part of a streusel cake IS the streusel. I also added a shot of espresso. The original, if you didn't see my earlier post today, is here. Anybody remember the crack-a-tooth cookie mishap? Well, this afternoon I had a lesson in "having the right tools". I couldn't find the rectangular cake pan! All I had was an 8" square. I think the hubs must have stolen the other cake pan for oil changing or some such thing. The resultant overflow looked like something from The Blob. It's alive! It didn't affect the taste of the coffee cake, I'm happy to say. This is some serious to-die-for coffee cake. But we'll prolly call this coffee cake the Ugly Bulbous Coffee Cake forever more. Combine all ingredients and mix well on high for 2 minutes. Spread 2/3 of the batter in a 9 x 13 cake pan. Sprinkle half of the streusel mixture over the batter. Pour in the remaining batter, and sprinkle remaining streusel topping on top. Bake 35-55 minutes at 350°. Knife should come out mostly clean when inserted into center. I just have to say again that this is some serious to-die-for coffee cake. I'm not sure I can share. I might have to tell the hubs that it tastes awful, just really awful, on top of being ugly, and he better wait for the next batch. Yeah, that's the ticket. This is such an awesume recipe. Took the cake to a bridge tournament and people were rushing back to find out who made it and ask for the recipe. Thanks for letting me have that "top of the class" feeling for the day! 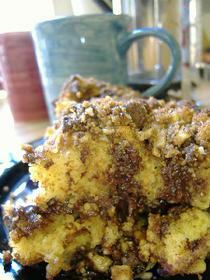 I made this Chocolate Chip Streusel Coffee Cake- it was AMAZING! I used plain whole yogurt instead of the sour cream, and 3/4 cup strong coffee. I also made more streusal- totally uneeded! Ended up not putting the extra streusal on. oh my gosh-this cake is delicious! Beware, you will eat more than you should! I'd rename this to "the coffee cake straight from he**"...because it will tempt you beyond what you are capable of withstanding! I don't know. It would sure be worth a try. If you do try it, post back here and let me know how it tastes, ok? Hey, this looks really yummy. I have got to try this sometime. Quick question: could a regular sponge cake be substituted for the yellow cake mix? Keewee, I love your photos of your teapot and china cups. Beautimous! D, I hope you and Wonder Woman like this coffee cake as much as I did. Ummm, do. It's not quite gone. Almost but not quite. And I decided to share after all, so I haven't decimated it all by myself. Showed this to my Wonder Woman and got a "Oh! Gotta have it!" Yummm! I used to tell my kids, "it doesn't matter what it looks like, it will taste the same. I have finally put a post up about my new teapots.